The Christmas celebration officially began here in Italy on the 8thof December with the observance of the Immaculate Conception of the Virgin Mary by the Roman Catholic Church. But the actual Italian start date for Christmas preparation seems a bit more flexible. Probably being influenced by the retail commercialization of Christmas in our homeland, store displays and merchandising here in Ascoli Piceno seem to have started appearing earlier in each year we have been here. But that is still nothing like the constantly advancing buying frenzy, calendar creep, in America. Fortunately, the Christmas Season in Italy still feels more traditional and family oriented and a bit less overwhelmed by consumerism than in the U.S.
We recently went to Rome for ten days to participate in an intensive Italian language course in preparation to take an examination of our ability to understand, speak and write in Italian. As we mentioned in a previous post, by passing this exam, we will be able to apply for a longer-term Italian immigration permission. That test is now behind us. We are optimistic about the test results but won’t have the official outcome for a couple of months. So more on that later. But the observation I wanted to make is that Rome is such a busy place and so filled with tourists that we didn’t have a sense of as much of the charm that we feel during the Christmas Season in Ascoli Piceno. In Rome many of the holiday light displays were already installed over some streets and the Christmas Market had been set-up in the Piazza Navona just before we left to come back to Ascoli post-test. Over recent years, the Christmas market in the Piazza Navona seems to have taken on more of a County Fair atmosphere. Many of the temporary, wooden market stalls featured stuffed ‘plush’-toys typical of any time of year. And then there were offerings of very realistic-looking, toy military weapons to excite sweet children during this season of love. Surrounding Bernini’s Fountain of the Four Rivers, there were also midway-style, arcade games to play. And there was even cotton candy. Another impression of Christmas celebration preparation in Rome was a conspicuous presence of law enforcement and uniformed Italian Army personnel armed with automatic weapons. They were courteous, and we made it a point to greet them. We felt glad they were there given the tenuous world situation but the contrast with the traditional theme of the season was a bit stark. The number of stalls in Piazza Navona displaying Christmas tree ornaments and components for home Nativity displays, a Presepi, seemed fewer this year. The tradition of the Presepi is one that has its roots in the Neapolitan area of southern Italy. It is an opportunity for families to be creative in making village scenes of the Christmas Nativity Story, but somehow set in medieval Italy. This is probably for the same reason Renaissance depictions of Jesus and the Virgin Mary, who were of middle-eastern, ethnic origin, have a decided Italian look. While the Christmas Tree tradition has gained in favor in Italy as an alternative, there are still Presepito be found in many households. Arlene’s flair for tasteful, seasonal decorating brings warmth to our apartment. This is especially evident in her Christmas decorations and particularly with our tree which sits in a translucent bay window in the view of passersby. Every Christmas, Arlene engages her very special culinary talent in baking quantities of holiday pastry treats as gifts for our friends and some of the exceptional vendors who are a joy to work with. Speaking of holiday decorating, we suppose it is in the nature of the leadership in communities to look for ways to make repetitive events fresh and interesting. But Italy is a place steeped in tradition and hitting a balance between innovation and honoring tradition can be tricky. 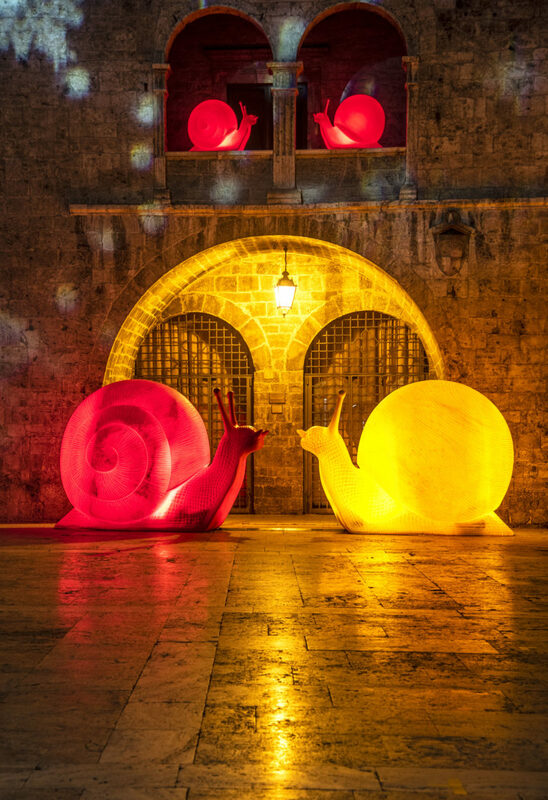 This year here in Ascoli, a decision was made to forgo the traditional Christmas-themed lighting in Piazza Popolo in favor of eighty, large, recycled plastic, lighted animal figures in celebration of nature. There was at least a nod to the season in images of falling snow being projected onto the medieval façade of the Palazzo di Capitani. It is mild to say the reception in the community to this modern art endeavor, the “Cracked Art, Zona Rosa”, was ‘mixed’. An interesting concept for possibly some other time of year but a little removed from a traditional Christmas theme. To be ‘avant-garde’ is to probably be a bit ahead of your audience. But this celebration of nature during a more traditional Christmas observance, might have been a bit too far ahead for some. However, the Commune did do some more traditional decorating in some of the other picturesque piazzas in the historic center where we live. Whether that balance between tradition and innovation was sufficient remains a topic of animated discussion in Ascoli these days. One thing Italians can be counted on is to have and express opinions. As stimulating as Rome is, we were very anxious to return home to Ascoli. These now familiar late medieval streets and lanes have become very comfortable and reassuring to us. But above all, an ever-widening circle of Italian friends and English-speaking expatriates has added a great deal to our lives. It is very likely in uprooting ourselves and in attempting to acclimate to a place very different than where we had previous lived, personal relationships seem to have become even more important. We had found travelling in Italy in the past very comfortable. But passing through as a tourist and actually imbedding yourself somewhere as a member of a community are very different experiences. To now be able to walk down a street and to be warmly greeted by people we know has a great deal to do with making a place feel like home. In this celebratory season in Ascoli, there have been a number of cultural events including performances of a Russian Ballet troupe doing Swan Lake. Almost every day has some special event in evidence. Nearby, there is an exceptional town that features a live Presepi, Nativity re-enactment that involves almost the entire village in costumes in a medieval historic setting situated above the Adriatic Sea. And there have also been any number of festive social events in the homes of friends. 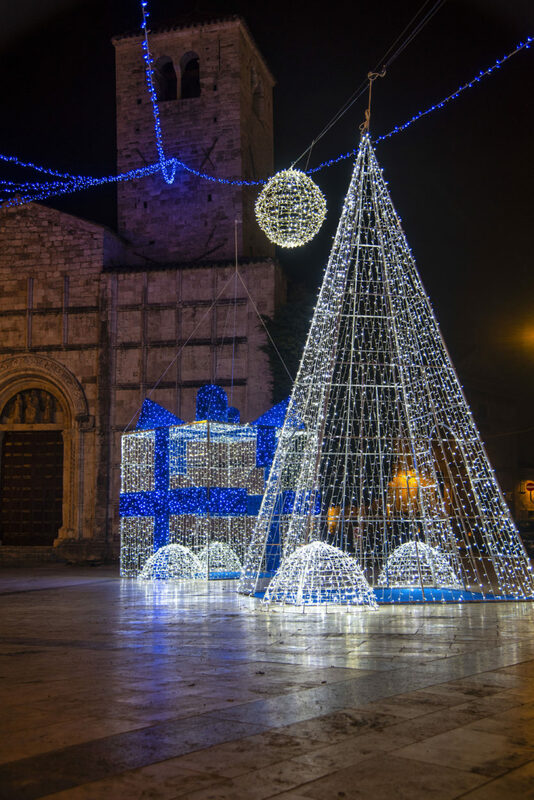 All of this is what makes make a Christmas celebration in Ascoli Piceno so special. What is making this Christmas so very special is we are anxiously looking forward to our first Christmas in Italy with family around us. Our oldest daughter and her three children are coming from the San Francisco, California area and it will be their first visit to Ascoli Piceno. Time has moved on and these three grandchildren have become young adults with one soon to finish undergraduate school and the youngest about to finish high school. Their dad could not, sadly, join the trip as he is minding the home-fires and caring for the family pets. Balancing the schedules and calendar obligations in a family of adults is daunting. As a result, their visit will be for a little under a week, but we are very gratified to have them come to experience a bit of our new life, first hand. The physical distance from our immediate families and friends in the U.S., has not diminished the deep caring we have for each other. With the visit of our oldest daughter and her children, as of now, all of our daughters and grandchildren have visited our home in Ascoli Piceno, Italy. We anticipate repeat visits just as we will make return visits to the U.S. to connect in person with family and friends. If there is anything we can take from this holiday season it is for all of us to do what we individually can to feel better connected to others. There is probably no better way to reduce conflict, strife and alienation. In the multiplicity of religions in the world, a common theme is the overriding need to live lives rooted in compassion for others. MAY THIS HOLIDAY SEASON FILL YOU WITH WARMTH OF THE LOVE OTHERS HAVE FOR YOU AND YOU SHARE WITH THEM. Lovely, and what a stunning tree Arlene! Wishing you all the most memorable holiday yet with family around you. I’m sure they will come away with memories that they will treasure forever. Buon Natale!